Flywheel and stator on right side of the bike. Until 1998 pickup coil (green – black) was 23ohm. After it’s 165ohm. Pickup and Spark Signal at 1460RPM. Pickup and Spark Signal at 2880RPM. Pickup and Charge voltage at 1770RPM. Pickup and Charge voltage at 2370RPM. I you have a problem say it here, perhaps someone can help..
I’ve a KTM GS620 SC from 1996 with a kickstarter, it is a 4T . Who can give a suggestion or has already experience which CDI published on transmic.net is usable for this engine? posso montare tm 11/10 al posto di tm 14/05 su husqvarna 1988? il filo blu a cosa serve? Posso montare tm 11/10 al posto di tm 14/05 su husqvarna 1988? il filo blu a cosa servono? Hello found the schematic to be a little outdated any chance you can help source more modern components? I am looking for an AC CDI for my KTM 620 (I think the ignition timing is either 36 or 38) will the AC CDI product you sell work for me? I would not say “outdated”, it’s not about Fashion ! A processor is needed if you want to do fancy things but for triggering a SCR at 5 volts a diode do the job perfectly and in reliable manner. Hi there, great page thanks for this info. I have a 1996 KTM 620 with an SEM stator, getting no spark. After testing the resistance across the stator wires (all seem ok) i note that the black lead has continuity with the frame of the stator itself, and therefore the bike. Is that normal ? i don’t understand how that could be given that the kill switch effectively connects the black lead of the coil (through the orange) to earth to kill the motor. Yes it’s normal, CDI is grounded to the frame through the black wire. Disconnect the orange wire to check if you don’t have a permanent kill…. ok cool sorry to be obtuse, but the cdi being grounded to the frame via the black means that the *stator being grounded to the frame via it’s ‘own’ metal body is normal. gonna try disconnecting the orange wire tonite. Absolutely. cdi is grounded through the stator. Stator is connected to the frame. ok i have a spark but it seems to my amateur eye that the spark is weak and / or intermittent. i am able to hold the sparking end of the plug against the frame and am only slightly uncomfortable with the shock, from memory it should give me a whack (i didn’t start by holding it in my fingers!). Up until now i have had intermittent probs including problems hot-starting, which i understand can point to a bad stator. Coil resistances are correct, plug lead and plug are ok. Gonna bite the bullet and replace the stator. I’ll let you know how it goes. I incline to think it’s the CDI not the stator that it’s faulty. do some measurements (voltmeter, oscillo) before spending some bucks! Hi again, sorry to abuse your hospitality but you clearly know more about this than me.. I read your message below late and when ahead and ordered a stator. it arrived and i’ve installed it, in my opinion the spark is better and importantly consistent when the plug is outside of the bike. however, i have a serious ‘kickback’ problem, which i guess is caused by bad (too advanced?) timing. The new stator does not have a timing mark on it, and the old one didn’t either so i have no idea how to time it ! even on the most ‘retarded’ setting it kicks back (i cant go back any further), never used to do that with the old stator. is that further indication that the cdi is faulty? i don’t have an oscilloscope btw. i appreciate any advice you might have,. I think that the 3 bolts are not aligned so it’s not possible to fix it the wrong way… Right? Have you at least compared your measurements on the CDI with the resistance map above ? Everything match? Without any measurements neither oscilloscope traces done before and after replacement it’s just a shot in the dark ! sorry i should have been more explicit, i have measured the resistances of the cdi and they match your table above (SEM before 1999). You can potentially mount it 3 ways, by rotating it on the 3 holes, i have mounted it the way it appears in all the photos on the net (and the way i found the old one). after that there is a degree of movement to adjust the timing, because the holes are not circular. gonna get back out there tonite after finding some detailed pix on the net of the position of the marker, hoping its the same on mine. problem is this game is breaking my ankle ! The original SEM stator has a timing mark on the tight bump where is the pickup. This line should be visible through the timing cover. You must place the pickup coil of the new stator at the same place. Hi again, sadly that’s not the case (i’m pretty sure), lookup in the pic on this page and you see that the inspection window is not correlated with the ‘poles’ of the stator, its kinda 5 o’clock if the pickup is noon. after playing in the garage there is only one way it can go, the way in your photo, and i’m not able to retard it enough for it to work… sigh. Well we can assume it’s fit the good way then! Try to add a 1K adjustable resistor in series with the GREEN/pickup input wire. Hi again, in my frustration i went ahead and bought a new cdi to go with the new stator.. ST5500L and CD5004. my thinking was that replacing the 2 together should eliminate any incompatibilities.. wrong. the kickback problem is still there. if i switch back to my old stator, the kickback problem goes away (with either cdi! ), it can sometimes ‘just’ idle for ~10 s but then dies, the reason why i wanted to replace it in the first place. think i’m gonna try your idea of putting a 1k resistor on the pickup circuit to more closely emulate the original stator. 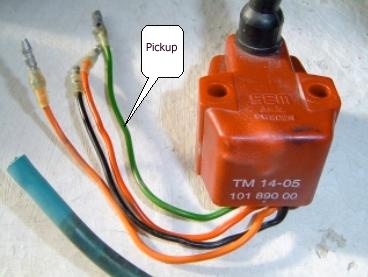 hi again, i put an adjustable resister in series with the green pickup line. tried kicking it with the plug outside of the bike to see at what point the spark dies, for me i only needed to add about 30 ohms before it stopped sparking. wouldn’t start with the resister in place though. remove the resistor and it goes back to the kick-back behavior. i’m wondering if the company that supplied the stator mixed models, gonna ask them to send a replacement.